SECTION 8 CONTAINS A BINDING ARBITRATION CLAUSE AND A CLASS ACTION WAIVER. THEY AFFECT YOUR RIGHTS. PLEASE READ THEM. IF YOU DO NOT AGREE TO ALL OF THESE PROGRAM TERMS, PLEASE DO NOT PARTICIPATE IN THIS PROGRAM, OR TERMINATE YOUR MEMBERSHIP, AS APPLICABLE. 1.1 The Topps Now™ Loyalty Program (the “Program”) is offered only on www.topps.com, at the sole discretion of The Topps Company, Inc. (“Topps” or “we”). Your participation in the Program is subject to all present and future Topps terms and conditions, including the Topps Now™ Loyalty Program Terms and Conditions (these “Program Terms”). These Program Terms do not alter in any way the terms or conditions of any other agreement you may have with us, including any agreement for products or services. Program Terms are void to the extent prohibited by law. 1.2 Membership in the Program is open to individuals who are legal residents of the United States (including its territories and possessions) who are at least 18 years old or the age of majority in the Member’s jurisdiction of residence, whichever is older, for their personal use only, and is limited to one (1) account per individual. You do not need to join the Program in order to purchase products on www.topps.com. Corporations, associations, or other groups may not participate in the Program. Employees of Topps are not eligible to participate in the Program. Topps reserves the right at any time to limit the number of participants in the Program or in any individual Program Tier (defined below). 2.1 Eligible individuals may enroll in the Program by visiting here and following the prompts to join the Program by creating an account or logging in and agreeing to these Program Terms. By creating an account, you are also creating an account for www.topps.com. Only one (1) account may be associated with a single email address. In the event of a dispute over ownership of an account, the Member will be deemed to be the authorized account holder of the email address submitted at the time he/she joined the Program. For purposes of these Program Terms, the “authorized account holder” is the natural person who is assigned to the submitted email address by an internet provider, online service provider, or other organization (e.g., business, educational institution, etc.) that is responsible for assigning email addresses for the domain associated with the submitted email address. 2.2 You may be required to provide your full name, mailing address, email address, and date of birth and to create a password in order to create an account. You are solely responsible for maintaining the accuracy and privacy of your account information and for updating it as required. To redeem Points for a Reward (as defined below), you must have a valid physical address linked to your account. 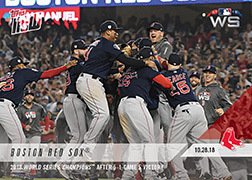 3.1 The Program is a way in which we reward and thank our loyal customers for purchasing Topps® products and/or taking other Program-related actions. You may unlock Program loyalty tiers (each a “Tier”) by making eligible purchases or taking certain other qualifying Program actions. Actions may require additional disclosures by you in order to qualify. You may earn Program points (“Points”) for dollars you spend on each qualifying transaction on www.topps.com, excluding federal, state, and local taxes, shipping charges, employee or other discounts, and items purchased with a gift card, merchandise credits, or any Rewards or other awards. Topps may also, at its sole discretion, provide additional Points in connection with certain transactions and promotions. Once you unlock a Tier, you may be eligible for certain benefits, perks and rewards (collectively, “Rewards”) applicable to that Tier, which Rewards may change from time to time and may be offered on a limited basis. In order for your eligible purchase or action to qualify for Points, you must be enrolled in the Program, and you must be logged in to your account online prior to making such purchase or taking such action. Information regarding qualifying purchases and other actions to unlock applicable Tiers will be posted in the PROGRAM FAQ’S or may be communicated through other media (e.g., via direct mail, marketing communications, social media, etc.). Visit our PROGRAM FAQ’S to learn more about Tiers. 3.2 Points and Rewards earned through the Program have no cash value, are non-negotiable, and cannot be redeemed either in whole or in part for cash. Only the Member paying for products in a qualifying purchase may accumulate Points or Rewards. If you return items from a qualifying purchase or obtain Points through fraudulent or other activity that violates these Program Terms, the appropriate number of Points originally earned from such purchase or activity will be automatically deducted from your Member account balance. Points and Rewards do not constitute property of any Member or any other person and may not be brokered, bartered, pledged, gifted, sold, or otherwise transferred, other than by Topps or as otherwise expressly provided for in these Program Terms, and any receipt or use of Points or Rewards in violation of these Program Terms will render such Points and Rewards void. Neither Accounts nor Points or Rewards may be shared or combined. Points earned may not be eligible for redemption until twenty-four (24) hours after they are awarded. Points are not capable of being combined or transferred to any other type of promotion or award. After twelve (12) months of inactivity, Points will expire. “Inactivity” is defined as a period in which a Member earns no Points, makes no qualifying purchases, takes no qualifying actions, and redeems no Points. 3.3 We reserve the right to change how you unlock each Tier and how we evaluate each qualifying purchase and/or action. We further reserve the right to place limits on the number of purchases or actions that are eligible for the Program and/or any applicable Tier, and/or the number or types of Rewards you may receive or earn in any applicable Tier, in a given time period or for the duration of the Program, and/or any combination thereof. Some purchases may be excluded from the Program, at Topps’ discretion. 3.4 If you have concerns that a purchase or other action was not properly applied to your Member account, you should contact Topps Customer Service at support@topps.com. Your email must specify your name, address, phone number, and email address associated with your account, the date of the purchase or action, and the issue(s) you encountered. This email must be sent within forty-five (45) days after the purchase or action took place. We are not responsible for late notifications regarding purchases or actions not being credited to a Member account. 3.5 You may redeem Points for eligible Rewards by signing into your account. Rewards may only be redeemed for Topps Now® products available on www.topps.com unless expressly authorized by Topps. You cannot combine Rewards with any other coupon or promotion. Rewards cannot be exchanged or returned for another product or service or a monetary refund. Points used to redeem a Reward will be deducted from the total Points available in your Member account. Points may not be used toward purchases of gift certificates, charitable items, promotional value sets, sales tax, or shipping charges. Credits from multiple accounts may not be aggregated unless authorized by Topps. Taxes on Rewards may apply where required by law. You are solely responsible for any tax liability, including disclosure, related to your participation in the Program, including upon receipt of Points or redemption of Rewards. 3.6 Topps reserves the right, at any time in its sole discretion and without notice to you, to change Tiers and/or Rewards, how you earn Points and reach each Tier, and how we evaluate and reward your eligible purchases and other Program action. 4.1 By joining the Program, you will be automatically subscribed to receive and you consent to receive Program emails, including Program marketing emails, from us and/or our partners. Such emails include, but are not limited to, a Program welcome email, redemption confirmation email, an account update email, or other communications that relate to your membership. 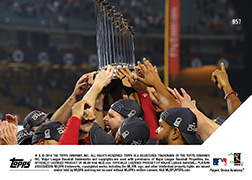 4.2 You may opt-out of the Program at any time as set forth in Section 5.5 of these Program Terms; however, you may still receive emails relating to your www.topps.com account, including marketing emails, from us and/or our partners pursuant to your www.topps.com subscription. 5.1 The Program and its benefits are offered at Topps’ sole discretion. We may, in our discretion, cancel, amend, modify, restrict, and/or terminate these Program Terms and/or the Program, or any aspect or feature of the Program, at any time without prior notice, even if such changes may affect Points already earned and/or the value of Rewards already accumulated and/or the ability to earn Points and/or redeem Rewards. 5.2 Membership may be revoked by Topps, in its sole discretion, at any time. Any abuse of the Program; failure to follow any of these Program Terms; membership inactivity for more than twelve (12) months; misrepresentation; or conduct that may be detrimental to Topps or our interests may result in the revocation of your membership and make you ineligible for further participation in the Program. If, in our sole discretion, we suspect fraud, misrepresentation, abuse, or violation of these Program Terms, we also have the right to take appropriate legal action. 5.3 If Topps terminates the Program or your membership is revoked, any Points or Rewards in your account or available to you prior to such termination or revocation will automatically expire, and your access to the Program and its features will automatically terminate, in Topps’ sole discretion. 5.4 Qualifying purchases and actions, as reflected in Topps’ records, shall be deemed correct, and Topps reserves the right to determine the qualification for any transaction and to correct or modify the Reward at any time based on Topps’ records and calculation of account information. 5.5 If you decide you no longer want to be part of the Program, you may cancel your membership at any time by contacting Topps Customer Service at support@topps.com. Your email must specify your name, address, phone number, and email address associated with your account, and confirm that you wish to be removed from the Program. It may take up to seven (7) business days for your cancellation to complete. You acknowledge and agree that, upon cancellation of your membership, you forfeit any Points you may have earned and/or any Rewards that might otherwise have been available to you during your continued participation in the Program. If you wish to return to the Program after cancelling your membership, you will be required to join the Program again starting with no Points or available Rewards. 6.1 Neither Topps nor its parent company, subsidiaries, affiliates, directors, employees, agents, partners, or licensors makes any representations or warranties of any kind whatsoever, express or implied, in connection with these Program Terms or any of the Rewards associated therewith, including but not limited to warranties of merchantability, non-infringement, or fitness for a particular purpose. We make no warranties that defects or errors will be corrected. 6.2 You agree that neither Topps nor its parent company, subsidiaries, affiliates, directors, employees, agents, partners, or licensors will be responsible for or liable (in contract, warranty, or in tort (including negligence)) for any (a) interruption of business; (b) access delays or access interruptions to the Program; (c) data non-delivery, loss, theft, misdelivery, corruption, destruction, or other modification; (d) loss or damages of any sort incurred as a result of dealing with or the presence of any third-party links on the Program site or on www.topps.com or use of any Reward of the Program; (e) computer viruses, system failures or malfunctions which may occur in connection with your use of the Program site or www.topps.com, including during hyperlink to or from third-party websites; (f) any inaccuracies or omissions in Program content; or (g) events beyond our reasonable control, including without limitation any act of God, act of war, natural disaster, cyberattacks, terrorism, or any act or omission of a third party. 6.3 You agree that neither Topps nor its parent company, subsidiaries, affiliates, directors, employees, agents, contractors, contractual partners, providers, or licensors shall be responsible to you for any direct, indirect, incidental, special, consequential, or exemplary damages, including without limitation damages for loss of profits, goodwill, use, data, or other tangible losses (even if Topps had been advised of the possibility of such damages), related to the Program or your participation therein, whether in contract, warranty, or in tort (including negligence) even if Topps has been advised of the possibility of such damages, and in no event shall Topps’ maximum aggregate liability for such claims exceed one hundred dollars (US$100.00). 6.4 You further agree that no claims or action in contract, warranty, or in tort (including negligence) arising out of, or related to, your participation in the Program, use of any Rewards or these Program Terms may be brought by you more than one (1) year after the cause of action relating to such claim or action arose. If you are dissatisfied with the Program, termination of your membership is your sole remedy. We have no other obligation, liability or responsibility to you. 6.5 Some jurisdictions do not allow the exclusion of certain warranties or the limitation or exclusion of liability for incidental or consequential damages. Accordingly, some of the above limitations may not apply to you. This Section 6 will survive termination of a Member’s participation in the Program. 7.1 You agree to defend, indemnify and hold harmless Topps, its parent company, affiliates, subsidiaries, directors, employees, agents, partners, contractors, contractual partners, telecommunication providers, content providers, and assignees and their respective officers, directors, employees and agents from and against any and all liabilities, claims, actions, demands, damages, costs, losses and expenses (including reasonable attorneys’ fees) made by any third party due to or arising out of your participation in the Program in violation of any law, rule, regulation, guideline, or these Program Terms, and/or your violation of any rights of another. 8.1 The Program and these Program Terms are governed by laws of the State of New York, without regard to its conflict of laws principles. You hereby consent to the exclusive jurisdiction and venue of the state and federal courts within New York, New York, for any claims arising out of or relating to the Program or your participation therein or the Program site. 8.2 Any dispute, controversy, or claim related in any way to the Program, these Program Terms, your Program membership, or the relationship between Topps and you shall be submitted to confidential arbitration in New York, except that, to the extent you have in any manner violated or threatened to violate Topps’ intellectual property rights, Topps may seek injunctive relief in any state or federal court in the State of New York, and you consent to exclusive jurisdiction and venue in such courts. Arbitration under these Program Terms shall be conducted by a single arbitrator under the rules then prevailing of the American Arbitration Association. The arbitrator’s award shall be binding and may be entered as a judgment in any court of competent jurisdiction. 8.3 To the fullest extent permitted by applicable law, no dispute under these Program Terms shall be joined to a dispute involving any other party subject to these Program Terms, whether through class arbitration proceedings or otherwise. You agree that you may bring claims related to the Program, these Program Terms, your Program membership, or the relationship between Topps and you against us in your individual capacity and not as a plaintiff or class member in any purported class or representative proceeding. 10.1 For more information about the Program and your Program membership, please contact us at support@topps.com. You may also find answers to your Program-related questions in our PROGRAM FAQ’S. We are not responsible for requests or correspondence that is lost or delayed in the mail or via the Internet. ©2017 TOPPS. ALL RIGHTS RESERVED.